MOSCOW, Russia – Spring started early this year in Russia. It rapidly boosted sales of summer sport goods, namely bicycles, kick-scooters, roller blades etcetera. However, apart from basic mass-market bikes and bike products, Russian buyers get disappointed failing on finding what they are dreaming on in their local stores. Unlike previous years with spring showing frequent rains, cold weather and only starting in June, this year everything worked for getting to higher sales and customer satisfaction. But the bicycle trade in Russia is faced with multiple threats which brings distributor reluctance to stock higher priced models. At first glance market circumstances seem positive. And not only weather-wise because inflation of the Russian ruble stands currently at a historic low of some 2 to 3% (compared to 5.4% in 2016 and 12.9% in 2015). Moreover, wages are up by some 7% (in 2017) while also more euros can be changed for Rubles benefitting importers. However all such official data hasn’t much to do with real life. In particular inflation proved much higher for low-income families with increased prices for basic food products and utilities. The impact of all this on the Russian bike market is hard to appreciate. The only official statistic available is on imports. That shows a 2017 import of 1.9 million bike products for a total import value of USD 80.4 million. 88% of it arrived from China (83%) and Taiwan (5%). According to a market study by BusinesStat (https://businesstat.ru) the import of high-end bikes from Europe and the U.S. accounts for just 50,000 units. The study concludes that total imports have increased 2% in 2017. Next to this import some 2 million bicycles were made in Russia. But taking these numbers into account, it should be noted that import and local production volumes may overlap. This is due to the fact that Russian companies, in order to meet their tax and financial goals, tend to ‘improve’ their records on the number of imported bikes and claiming them as their own produce. Government regulations were and still are the prime source of uncertainty in Russian market. After the U.S. and EU sanctions implementation, federal authorities moved towards better administering of Russian tax laws. It left most importers with less possibilities for ‘tax optimization’. Some of them decided to take a break to see how far the government would go. Unless an unspoken consensus is reached capitals could be temporarily withdrawn from this market. Another point worth mentioning roots in the 2014 ruble devaluation. In the following years the average mark-up dropped. Businesses started to get rid of previous years’ stocks almost at costs prices and sometimes even below them. Once retail prices again reached normal levels it left customers frustrated. They judged it as a temporary market twist leading to the postponement of new bike purchases or turning to the second-hand market. Public bikes and rental services profited from all this. Contrary to all these sales difficulties, cycling is on the up and up in Russia. Bike paths and lanes are becoming almost a must now in renovation plans for recreational areas. 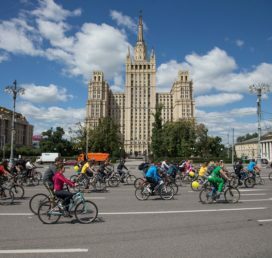 Not only in Moscow and large cities you are able to take a pleasant bike ride separated from all sorts of motorized traffic. Even in a number of smaller regional towns like Klin; the birth place of composer Tchaikovsky. Moscow’s bicycle life is certainly setting the trend. This is highlighted by several bike parades for which many central streets are closed for cars for a few hours. The latest one, which took place end of May, gathered some 30,000 participants despite rainy and chilly weather. Ongoing Cycling-to-Work initiatives attract more attention than ever before. And many companies mount bike racks outside their offices these days. By the way, such bicycle parkings are not very large. Moscow is eager to host bike shows. 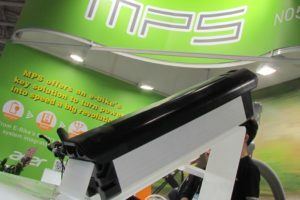 Currently two annual exhibitions are organized in the Russian Capital; VeloPark in early February and Bike-Expo in September. They are announced as mostly B2B events with one or two days for customers. Business programs include a number of meetings, work classes for startups, distributors seminars and announcements. They are popular although conducted mostly in Russian without translation. Most business visitors are interested in setting up a retail business. Classes and seminars are about sales strategies, trends and the combination off and online actions as online sales has become an important business factor in Russia. Sales of electric bikes didn’t take off yet on a big scale in Russia. 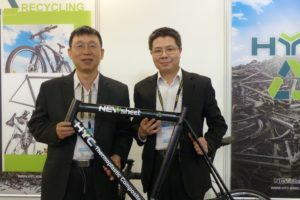 With average consumers looking for a new bike in the price range of some 300 to 350 euro, even low priced made in China e-bikes are out of their target price range. 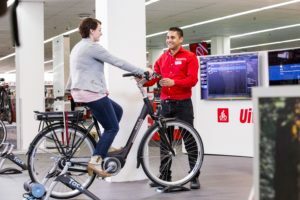 There are several companies promoting exclusively e-bikes. 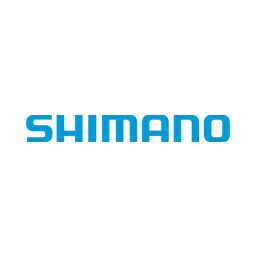 One of them – Elbike – is a long-time Russian electric market member. They offer a range of affordable e-bikes and lure customers with motorcycle-like monster show-stoppers. One may buy a starter folding electric model Pobeda at 570 euro. It weighs 17 kg allowing you to cover 38 km at one charge without even pedaling. 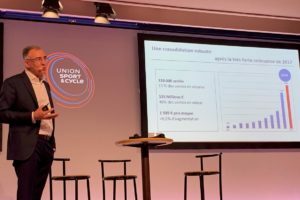 An average e-bike sells for some 1,000 euro retail. 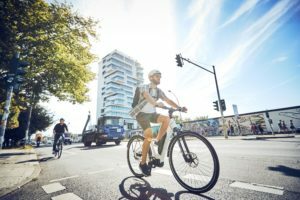 Currently the bottom line on e-bikes in Russia is that they remain a choice for enthusiasts as well as a small number of commuters which are very tired of the Moscow traffic jams.